The study set out to “fill in the gaps” in research about how various dietary habits affect the environment along the whole supply chain from land resources to water and energy. It focused on three demographic groups - White, non-Hispanic Back, and Latino - since they represent 92.4 percent of the U.S. population and looked into their eating habits to glean some insight into the relation between these habits and what it calls the food-energy-water nexis. The study’s authors note that the White population, as portion of the U.S. total, was 61.3 percent, with Latinx - a term the authors of the study call intersectional and non-binary to reflect the latest term trends in social sciences - accounting for 17.8 percent and the Black population accounting for 13.3 percent. In light of these proportions it’s hardly surprising the White population’s diet was a greater contributor to climate change in terms of greenhouse emissions. However, the study also suggested that the White group’s diet was a greater contributor to climate change because of its higher consumption of what the authors call “environmentally intense” food items. “Results indicate that Whites tend to consume the highest rates of environmentally intense food items, except for the apples food item, when compared to their Black and Latinx counterparts,” the authors wrote. 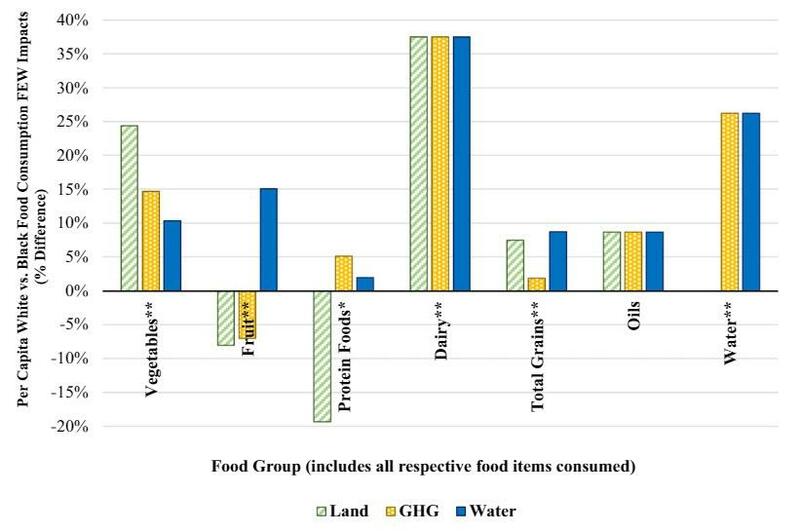 Whites yield the highest per-capita GHG and water impacts across all categories due to their consumption of environmentally intense food items in the vegetables, dairy, total grains, and water food groups, whereas Blacks yield the highest per capita land impact due to their consumption of land-intense food items in the fruit and “protein foods” foodgroups. So, will AOC ban 'white Americans' next?